In the current context, the anti-democratic axis as it were – that is, the Russia’s and Iran’s of this world – appear more willing to go “all in” to support their “proxies” than their pro-democracy counterparts in the West. That means we may be getting into bidding wars not that we can’t win – we have the bank and arms to outspend and out-supply just about anyone – but which we lack the will to win, whether due to flagging public support, setting too high a bar of excellence for our rebel or regime proxies (or fear of Mujahidin-like blowback), or – and this is where the 19th century comparison may be apt – because the stakes for us are perceived to be lower than they are for the Putins of this world. It is a mistake to think of contemporary civil wars in terms of some sort of international contest between democracy and authoritarianism, not least because it creates the false impression that the U.S. and its democratic allies have something at stake in these conflicts when we don’t. There are illiberal authoritarians aplenty on both sides in Syria, but there are hardly any democrats of any kind to be found, and that wouldn’t have been changed by a larger commitment of U.S. resources at any point. The ability to provide arms and funding to anti-regime forces has never been in doubt, but skeptics have been absolutely right to doubt the wisdom and desirability providing this aid. Look, I’d love to live in a world where every conflict has a “democratic” side. I’ll admit that when the Syrian civil war began as a series of largely peaceful demonstrations in early 2011, I had high hopes for change (and I think Larison may be overstating the absence of democratic elements in the Syrian opposition, at least looking back at that time). Such was the zeitgeist in the Arab world at the moment, when the fall of Ben Ali and Mubarak made anything seem possible, and I was as caught up in it as anyone else. When Bashar al-Assad made clear that demands for reform would be met with deadly force and the protest movement transformed into an armed uprising, I thought some kind of American intervention on the FSA’s behalf was a pretty reasonable proposition (though reading Lynch on the subject gave me pause). 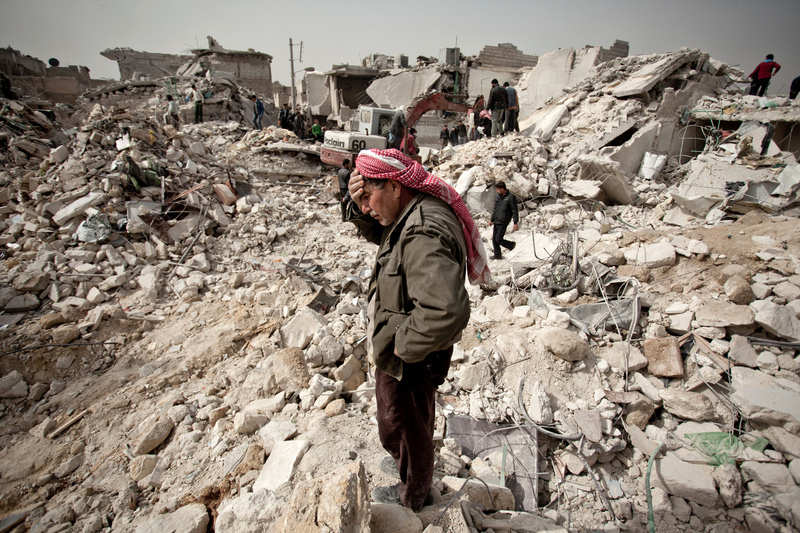 But there was more going on in Syria than met the eye: the civil war turned out to be more of a messy sectarian power struggle than a battle between democracy and totalitarianism, and as it has dragged on over the past three years, the moral calculus has only become cloudier. The main target of my anger for how things turned out remains Assad himself, who could have prevented all of this death and destruction had he been willing to engage with the protesters of 2011 rather than gun them down. Instead he chose to run with the narrative that Islamist terrorists were out to bring down his regime and proceeded to torture and murder his opponents by the tens of thousands, radicalizing the rebels and leading to… well, have you read the news lately? But in a state where no such thing as civil society has ever really existed, where democrats and Muslim Brothers alike have been tortured and massacred, and where Assad’s Alawite coreligionists believed (and still do) that they would be held collectively responsible for the regime’s misdeeds in the event that Assad ever went away, I highly doubt there was a way for the US to intervene on behalf of “freedom” and “democracy”, rather than merely empower some other faction. Regional leadership, such as the Arab League has continually failed to demonstrate, might have been able to pull it off, but as we ought to have learned from Iraq, there are very hard limits to what American guns can accomplish in service of the causes of liberty and peace.